Today I've been praying with this reflection by Pedro Arrupe SJ, a former Jesuit Superior General. It is, of course, very true: whatever we are in love with; wherever we choose to put our heart; whatever our deep, underlying passion may be - this does indeed decide everything. 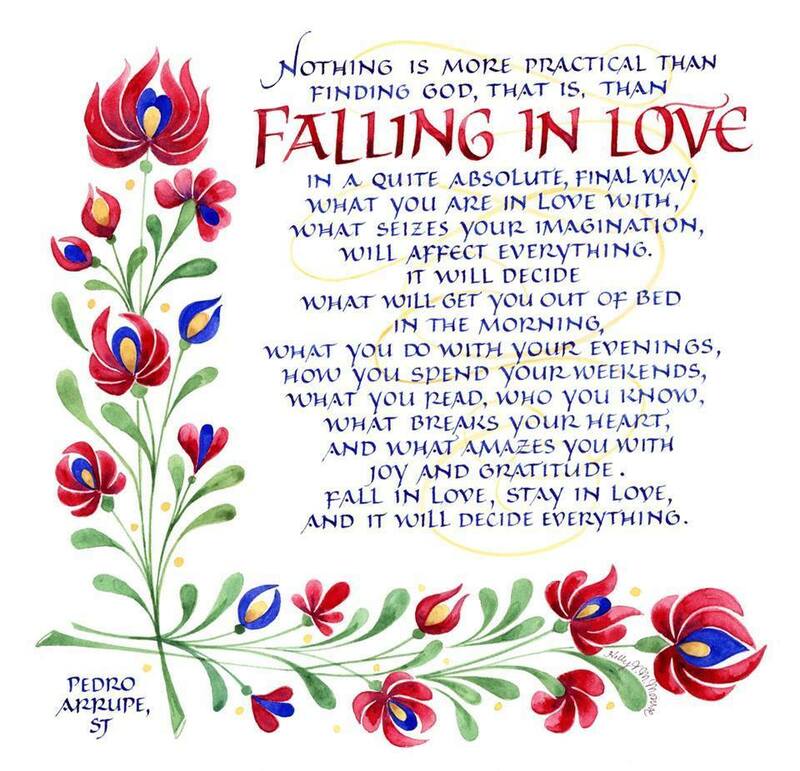 Falling in love is the easy part - even that word "falling" makes it seem as ridiculously simple and unpreventable as tripping over an uneven paving stone or slipping on wet leaves. Staying in love, though, is another matter. It requires fidelity and commitment, especially in tough times, but is about more than that: someone can grit their teeth and remain tenaciously committed even when love has grown cold, but that's not staying in love. Staying in love is about keeping love warm; about tending a longstanding fire to keep it burning. I saw this fire in my parents, still utterly, besottedly in love after more than 50 years, despite diminished health and all the arguments and setbacks of five decades; see it too in older religious, for whom being centred on God has become even more than second nature. Meanwhile I, somewhere in the midpoint, continue to discover that staying in love can sometimes be sheer delight, at other times hard work; but somehow, life would be unthinkable and unliveable without it. Mostly, it is an ongoing following of a choice made years ago; a journey excitedly embarked on in sunshine and fair weather, lovingly and hopefully continued in all climates. And today it occurred to me that for religious there is an added dimension - because what we are in love with is... Love! Being in love with God and remaining in love is about being and remaining in God, who is Love. It is this to which we are called and invited, not just at the beginning, but every day. And it is this being in Love which determines the what, the where and the who with of our lives; determines what breaks our hearts and what amazes us with joy and gratitude. 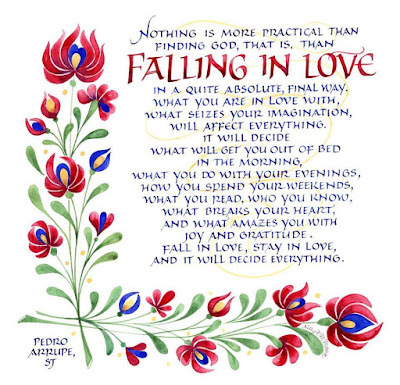 Being in Love, staying in Love truly is what decides everything. NB: One of my community gave me this depiction of the reflection a few years ago. I've seen it used on some other blogs and websites, but have no idea who created it. If you know please let me know, so that I can acknowledge the artist.